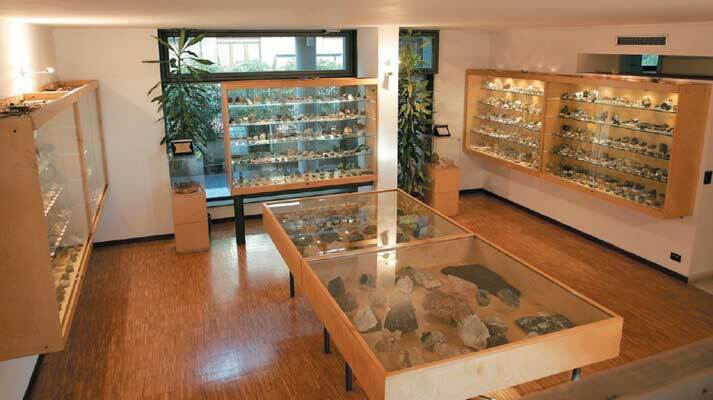 Since 1992, Vico Equense has hosted the Campano Mineralogical Museumwhich exhibits a collection of minerals originating from all around the world, collected through 50 years of research by engineer Pasquale Discepolo. The Museum is one of the most important scientific museums of the Campania region both for the number of varieties and the rarity of minerals on display. The exhibition is divided into three rooms, with a total of 25 displays in which3,500 minerals are conserved, belonging to 1,400 different species, varying in both form and colour. The sections follow a scientific criterion which divides the mineral world, with displays dedicated to oxides, native elements, sulfides, sulfates and carbonates. Further to the samples on display, there are also meteorites and some specimens of reptiles, two dinosaur eggs and other fossil plants and animals, exhibited in the paleontology section since 1997. Since 2001., the museum also presents a new section dedicated to gem stones, in which collection contains over 500 samples of stone with varying faceting. Entrance fee: € 2,00 –guided tour groups on appointment.